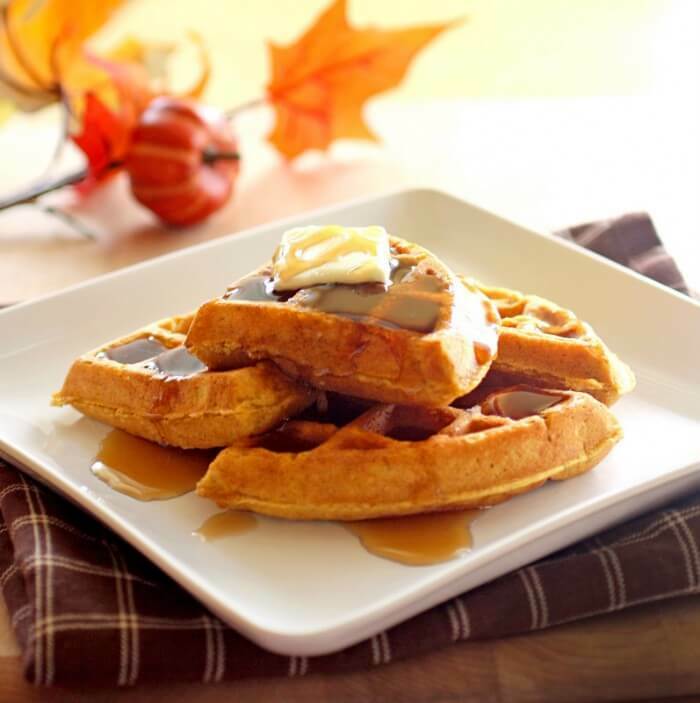 A delicious way to start a fall day! We enjoyed these waffles at last Sunday’s brunch, they are fluffy and delicious! Combine the bananas, pumpkin puree, eggs, almond butter, and coconut oil in a food processor or blender and mix well until the bananas are well blended with the other ingredients. Once smooth, add the coconut flour, pumpkin pie spice, baking soda, baking powder, vanilla, and salt and blend until well mixed. Lightly brush the waffle iron with the melted coconut oil. Using the waffle manufacturer’s guidelines for suggested cup [milliliter] quantity, ladle the batter into the preheated and greased waffle maker and spread it evenly across the surface, leaving a 1⁄2-inch (12-mm) border (the batter will spread with you close the lid). Cook, following the manufacturer’s directions, and when done set aside on a plate and keep warm while you cook the remaining waffles.